SNW:When did you first encounter Gerry Andersons "Thunderbirds?" MARK: When I was seven years old. I remember it was seven oclock on a Saturday morning and I was in my Grandfathers bedroom waiting for the first episode of "Thunderbirds" to be shown on Channel 12 out of Binghamton, New York. But I had already known about the "Thunderbirds" before I saw the first episode. About a month earlier my aunt and I were walking through the toy section of a local drugstore and I suddenly stopped dead in my tracks when I saw a kit of this wondrous spaceship, Thunderbird 1. The box art was unbelievable. My aunt saw me gawking at it and asked if I wanted it. I couldnt even speak, I just nodded my head. She bought it for me and a week later my Mom bought me the Thunderbird 5 kit. As any seven-year-old would, I put them together very badly. But I loved them. I still have them, in fact. The boxes got thrown away years ago, but I still have the models. So, there I was, seven in the morning, waiting for this show with the wonderful spaceships to start, not knowing what it was going to be about. Then here comes the old ITC logo and the 5 - 4 - 3 - 2 - 1 countdown. From the opening credits I was hooked. I knew I was going to be a "Thunderbirds" fan for the rest of my life. And twenty-six years later I still am. SNW: What was that first episode you saw? MARK: I cant remember, that would be asking a little too much from a seven-year-old, but, I remember it was fascinating. I was totally amazed. Anderson puppets were 20 to 22 inches tall. Their eyes were manufactured the same as human false eyes and their hair was real. Their heads were packed with electronics. Average cost in the 1960s for each puppet was £300 ($850 to $900). It took three months to construct each figure. Sylvia Anderson was the inspiration and model for Lady Penelope. MARK: No, it was years before I realized that the characters werent people that just walked funny. As a kid I really didnt know they were puppets. In 1969 I had the thrill of seeing Thunderbirds Are Go! [ a "Thunderbirds" feature-length film] when it showed at the local movie theater. This was one of the old-time theaters that seated about 2,000 people. The screen was sixty feet wide and nearly forty feet tall. To see the show, the vehicles, and all my favorite characters on this enormous screen was an unforgettable experience. It was incredible. I made my Mom sit through two showings. SNW: So you were an unquestioning, diehard fan from the start. MARK: Not unquestioning. Even as a kid I realized there were some goofy things about the show. What drove me crazy as a kid, and still does, is the inconsistency in the Thunderbird 2 detailing. On some model shots the "2" is the same size as the word 'Thunderbird.' In other shots it's double the size. Sometimes the base of the "2" is level with the word, other times it's centered. And sometimes the "2" is enormously huge. There was no continuity on the decaling of these models, so its very easy to point out where they re-used stock footage of the ship. SNW: Any other errors or inconsistencies? MARK: There are several common misconceptions about the show among fans that I would like to clear up with your readers. MARK: Many think that the real name of the character "Brains" is Hiram Horatio Hackenbacker. This misconception comes from an episode called Alias Mr. Hackenbacker. In it Brains introduces himself under the pseudonym of Hiram Hackenbacker. Following that episode the Century 21 publicists erroneously referred to him in press releases as Hackenbacker. Brains real name is never given in the show. Also, the Thunderbirds arch-nemesis was never referred to by name in the series. I believe he was first referred to as "The Hood" in the weekly TV-21 comic strips. When "Thunderbirds" was later released in a half-hour format, Scotts voice-over narration would recap the action from the previous episode. In these summaries Scott started referring to the villain as "The Hood." Another thing that drove me crazy as kid was that The Hood was always foiled in photographing the top-secret International Rescue vehicles by the camera detectors onboard the ships. So why didnt he just draw a picture of the ships? It was just one of the little things they did that was really, really dumb. SNW: How did you go from a loyal fan to a collector? MARK: I started picking up fan magazines. In Monster Times I found a classified advertising for "Fireball XL-5," "Stingray," and "Thunderbird" stuff. I hadnt heard of "Fireball XL-5." I had seen "Stingray," but had never made the connection that the shows were made by the same people who produced my "Thunderbirds." The dealer was very kind to a young boy. I was about twelve at the time. He took time in his letters to explain about the different shows. He sent me copies of photographs. Most importantly, he gave me phone numbers and addresses of other collectors. Some werent interested in wasting their time with a twelve-year-old. But others were receptive and we got to be friends and started exchanging things. My collection was beginning to mushroom. I next wrote to ITC in New York City. They sent me quite a few things, plus an invitation to visit ITC in New York. Since my cousin lived in New York, I took them up on it. I got a whole bunch of goodies, exhibitor campaign books, 35mm slides, photographs, 8x10 stills, etc. SNW: What is the most unique item you acquired in these early years of your collection? MARK: That would have to be my original transparency. I wrote to National Screen and inquired about Thunderbirds Are Go! movie posters. They replied that they couldnt sell me any since I was not a movie theater. So, persistent little booger that I was, I called the number on their letterhead and talked to a gentlemen who gave me the phone number for the warehouse. At the warehouse I talked to another nice gentleman who pulled the file on both Thunderbirds Are Go! 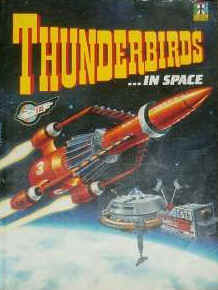 and Thunderbird 6. The only item left was the original 8" x 12" color transparency for the one-sheet of Thunderbirds Are Go! He couldnt sell it to me, but he would mail it to me if I would promise to reimburse him for the postage. In three months those files were going to be cleared and it would have been destroyed forever. He mailed it to me and I very promptly mailed him postage money back plus a couple bucks additional. He called me up and thanked me for being so honest. Thats how I acquired the original artwork transparency for the poster. SNW: Thats the artwork on the "Thunderbirds" laser disk? MARK: Yes. When MGM wanted to release Thunderbirds Are Go! and Thunderbird 6 in letter-box format on laser disc, they discovered they didnt have any original artwork. I was happy to provide them the cover art and most of the cover photos. That was a thrill. SNW: Where did your collecting urge take you next? MARK: By this time I had also gotten in contact with Canadian fans. The show was still being shown there and merchandise, especially British merchandise, was easier to obtain. I was working after school and on weekends. About 80% of the money I was earning was going to pay for Anderson stuff and my phone bills. I was calling London, Newfoundland, and other foriegn places on a weekly basis. SNW: How old were you at the time? MARK: I was twelve. My monthly phone bill was $450, rather high for your average twelve-year-old. But I didnt care because I was getting lots of "stuff." I managed to acquire a full set of TV-21 magazines [a British comic publication]. With these in hand, I figured that was it, there wasnt anything I didnt know about the shows. I next started acquiring copies of the films and the episodes on film. Back in 1972 there werent any VCRs around and the idea of having these shows on videotape was unthinkable. I managed to get some of the 8mm of the shows that were put out by Arrow in England. These ranged from five-minute featurettes to full-length episodes. Around the same time WPIX in New York City reran "Thunderbirds" in the half-hour format. That was just terrific because it revitalized my love for the shows. SNW: Many Americans are unfamiliar with the show. Are "Thunderbirds" fans primarily in the UK? MARK: Its largest following is in Japan. "Thunderbirds" was bigger in Japan than "Star Trek" will ever be in the United States. The Japanese have kept the flame for thirty years. A full listing of all the Japanese merchandise and premiums would be the size of an encyclopedia. SNW: "Thunderbirds," as with most Anderson shows, was most noted for its hardware and incredible vehicles. What do you consider some of the more interesting vehicles from the show? MARK: A lot of the background vehicles that were used in the episodes were Matchbox cars and trucks. Probably the most easily recognizable one is the Matchbox Cooper-Jarret transport from the early sixties. This tractor-trailer combination was used as background in half the episodes; it was nothing more than a standard Matchbox toy. Sometimes the cab roof was drilled out and a flashing grain-of-wheat bulb was installed. Most of the airport scenes have this Matchbox vehicle and in Day of Disaster several are seen moving on the highway behind the giant rocket transporter. Anderson used Matchbox vehicles everywhere. Different cars, construction vehicles, everything. Theyre easy to pick out from photographs or a paused VCR. Many of these Matchbox cars are available at not too ridiculous a price or you could possibly pick them up at flea markets or where ever you find old Matchbox cars. For little money you can have the beginnings of an accurate Anderson background-arama. SNW: What advice would you give to a "Thunderbirds" collector? MARK: By all means, enjoy your toys. You bought them, play with them! So many people I talk with say that they are going to leave these things mint in the package thinking they'll be worth so much money. Granted, toys like the Matchbox die-cast are expensive now, for the simple reason that there is a very big demand for them. But they are not a collectible like a Hummel figurine or a limited edition item. They are hard to get now because dealers are buying them up as fast as they can and selling them for ungodly rates. My prices are high, too. I wouldnt pay my price for them. I'd wait until I could get them cheaper. Matchbox paid hundreds of thousands of dollars for these molds. Once the mold is made, the actual cost of producing die-cast toys is nil. Matchbox will flood the market with these things for years. I believe the Matchbox "Thunderbirds" items will be readily available in the States around 1994-1995. Those who cant wait that long will pay premium prices. The smart people will wait. SNW: You mentioned the metal vehicles. What about the plastic kits? MARK: I dont suggest anyone stick them up on the shelf thinking theyre going to be worth a lot of money in the future, because theyre not. Theres too many of them. Older kits are constantly being reissued. This stuff is never going to have the value of an old Aurora Monsters of the Movies kit. Open the things up (always keep the box), build this stuff, customize it, make it your own, have fun! Thats what Gerry Anderson was all about, enjoying the fantasy. SNW: Why do you continue to collect? MARK: I love it. Ive been doing this for twenty-six years and its something I really enjoy. Ive just got tons of stuff. Ive got over 15,000 color and black-and-white photos of scenes from Anderson shows. If anybodys in my area and wants to come up and see me, all they have to do is call in advance to make an appointment. Theyre more than welcome to come and see what I have for sale and whats in my own private collection. Quite a few people have already stopped by. Im always happy to meet a fellow Anderson collector.